In our last segment we discussed the pressure Akbar came under from fundamentalist Muslim critics who felt his activities at the Ibadatkhana went against Islamic faith. As a counter-balance, Akbar's court historians worked hard to paint a positive picture, explaining the religious assemblies as Akbar's effort to strengthen the Muslim faith. Regular assemblies for Muslims began taking place at the Ibadatkhana around 1575 A.D., and by 1578, Akbar had opened the venue up to representatives of other faiths. Over the next four years, from 1579 to 1582, Akbar's critics put on the pressure, and by 1582 he was forced to discontinue religious debates in Fathepur Sikri. "…an enquiry was conducted into the affairs of the Chief Sadr, Abdun Nabl, who was found to be extremely corrupt and tyrannical in his dealings in the distribution of charitable lands (Madad-I-Mash). Soon he was dismissed. A number of fatwas were given by the Qazis, declaring Akbar to be a heretic. 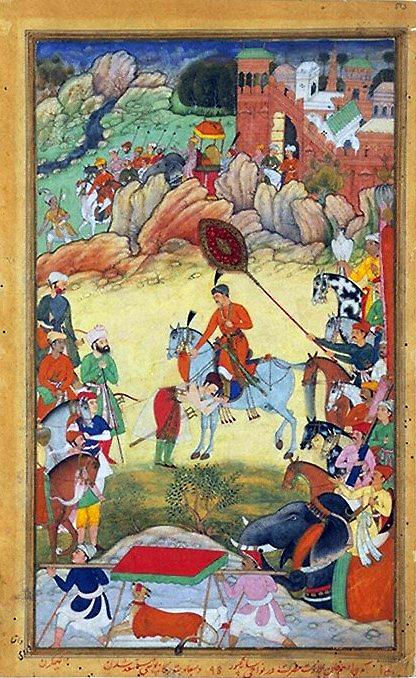 Akbar suppressed the rebellion and gave drastic punishment to the Qazis. To further strengthen his position in dealing with the Mullas, Akbar issued a Declaration or Mahzar. Mahzar means pronouncement, declaration or an opinion, it also implies petition. Akbar removed the Chief Preacher at Fatehpur Sikri and himself mounted the Pulpit of Jama Masjib, Fetehpur Sikri on June 22, 1579 and read the Khutba in his own name like the prophet and caliphs. The Khutba was composed in verse by Faizi. Mahzar was issued in September 1579 and was prepared by Sheikh Mubarak. It was signed by all the prominent Muslim theologians and divines of the Mughal empire. The Mahzar was signed by Makhdum-ul-Mulk and Abdun Nabi also, although they were known to be bitter critics of Akbar's liberal religious policy." As instituted under the Mahzar, it was decided that Akbar would have the right to be the supreme arbiter or interpreter of Islamic laws, and he could decide in the matter of differing opinions on all religious questions. His decisions were to be final and binding. This didn't give Akbar the right to set new Islamic law, only to settle disputes -- including disputes about his own activities. The proclamation giving Akbar the right to settle religious disputes was issued just a year after the multi-faith religious debates began, and three years before he was forced to shut the Ibadatkhana assemblies down. In other words, the pressure even in the first year of the all-faith debates must have been very significant. "The debates in Ibadat-Khana had not led to a better understanding but to greater bitterness, as the representatives of each religion denounced the other and tried to prove that their religion was superior to others. Hence in 1582 Akbar discontinued the debates in the Ibadat Khana. But he continued his quest for truth. The studies and discussion on various religions gradually convinced Akbar that while there were differences of sect and creed, all religions had a number of good points. He felt that if the good points of various religions were emphasized, an atmosphere of harmony and unity would prevail which would be for the good of the country. Further, he felt that behind all the multiplicity of names and forms, there was but one God. Badayuni asserts that as a result of this Akbar gradually turned away from Islam and set up a new religion which was compounded of many existing religions – Hinduism, Christianity, Zoroastrianism, etc. However, modern historians are not inclined to accept this and think that Badayuni has exaggerated. There is little evidence to prove that Akbar intended or actually promulgated a new religion. The word used by Abul Fazl and Badayuni for the so called new path was "Tauhid-i-Ilahi", which literally means 'Divine Monotheism'. The word Din or faith was not applied to it till 80 years later by Mohsin Fani." Upon close examination, Akbar's Tauhid-i-Ilahi is found to be not a religion, but simply a path for spiritual exploration. In the same interfaith mood of his religious assemblies, the Tauhid-i-Ilahi was constructed by way of Akbar cobbling together the religious practices and notions he found most palatable. By the end of his life, Akbar apparently remained unable or unwilling to surrender to any one faith, or to practice it strictly in accordance with a specific doctrine. Instead, he maintained a middle-of-the-road stance that was aimed at easing political unrest, and at easing Akbar's mind from his anxiety about death. Surrender to the One God does not appear to have been a central part of his personal practice.